Welcome to The Ronsley - A dramatic transformation and expansion of an existing timber loft building in the heart of Chicago's trendy River North neighborhood. By adding three stories and around 60,000 square feet of new construction, the existing 5-story building was transformed into 160,000 square feet of luxury condominiums. This 41 unit project offers one, two, three and four bedroom residences, as well as six 5,000+ square foot penthouses. All units feature expansive outdoor spaces with sweeping views of the city, 13-15 ft ceilings with floor-to-ceiling windows, high-end appliances and finishes. The six penthouses offer spectacular space for luxury living and entertaining as well as multiple terraces on three floors. On-demand dry cleaning, private elevator access, fitness center, large common deck, and guest entertainment are just a few of the extraordinary amenities offered at the Ronsley. The penthouses at this new construction project are truly spectacular. Each of the six penthouses includes three floors of extraordinary living space and terraces ideal for families and for entertaining on a large scale. The penthouses have floor-to -ceiling windows and private elevator access. No details were missed in these urban oases. 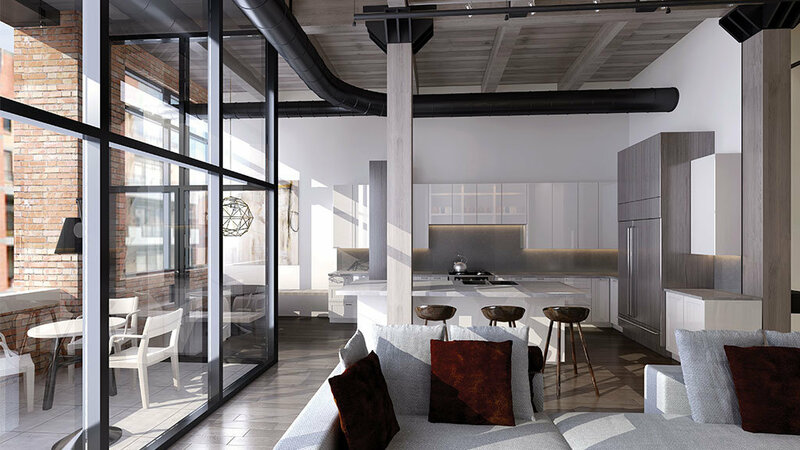 Created from an expansion and addition to an existing timber loft building, which was once used as a warehouse fo a theater staging company, the residences have offer extra high ceilings, large spaces and oversized windows. A stylish urban neighborhood that borders the Magnificent Mile and is just across the bridge from the Loop, River North is the go-to area for those who appreciate fine art and design. And for those who want to stay on top of new restaurant trends, there is no better place to explore than River North. Originally dominated by dormant factories and industrial warehouses that began their transformation in the 1970s and 1980s, the area became known for work spaces and studios for artists. A transformation of warehouses to hip and modern lofts followed, and many of them were converted to condominiums. Artsy during the day, the mood shifts into high gear at night. River North has a buzzing restaurant and bar scene and includes just about every type of cuisine. After hours entertainment is lively with sleek new clubs, upscale wine bars and craft cocktail lounges.